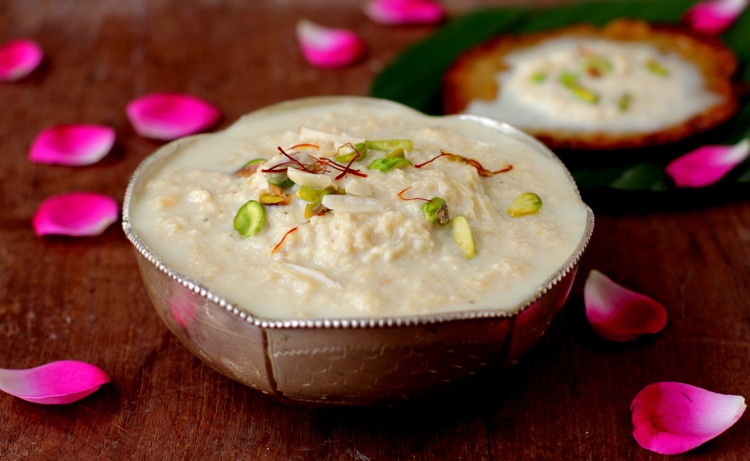 Rabri: Rabri is a sweet, condensed milk based dish made by boiling the milk on low heat for a long time until it becomes dense and changes its colour to pinkish. Sugar, spices and nuts are added to it to give it flavour. It is chilled and served as dessert. Rabri is the main ingredient in several desserts, such as rasaballi, chhena kheeri, and kheersagar. Boil the milk in wide mouthed non-stick pan, on medium flame. Change the flame to low, once the milk comes to boil. Continue to cook the milk on low flame. Let the malai (cream) thicken at the edge of the pan. As soon as the milk thickens to the side of the pan, stir it in. Continue cooking, until the milk turns thick and reduces to 1/4 of its original volume. Soak the saffron threads in 2 tbsp of warm milk. Add in the sugar and green cardamom powder to the boiling milk. Stir well (adjust the sweetness according to your taste). Cook till the sugar is fully absorbed. Add the soaked saffron threads and half of the slivered almonds and pistachios. Cool the rabri to the room temperature. Note: the rabri will thicken when cooled. Add in the rose essence. Refrigerate the rabri for 2 hours. Ladle the chilled rabri into serving bowls, garnish with chopped nuts and serve.